Making cheesecake has always intimidated me so it was only later in my life that I mustered up the courage to bake one. I went through various cookbooks and the length of the recipes would always put me off. The question is always….baked or fridge cheesecake. I think it’s split down the middle to who likes what. Then I had a few recipes that sagged in the middle, also not good and my search continued until……. one day, a Jewish friend of mine came to my rescue and gave me this easy throw-together version. She swore by it and told me this is “the original Jewish cheesecake recipe”. I was not going to pick an argument with someone that has just given me the answer to my search so I decided to give it a try. My verdict – she is right!!!!! It is the cheesiest, crumbliest and most delicious cheesecake I have ever had and I have made this for hundreds of people(I cater) and the responses are always overwhelming. Pulse biscuits in food processor. Melt butter and syrup and mix with biscuits. Preheat oven to 180 C.Mix everything together with a whisk and fold in beaten egg whites. Pour into prepared pan and bake for 25 minutes, switch the oven off and let it cool in there!!!! Please do not worry if cheesecakes are still wobbly after cooking time, leave it, it will settle. Do not bake any longer. Nina, you have come to my rescue! I have been looking for an easy, cheesecake recipe for ages. I’m printing this to try in the next few weeks (after Greek Easter) so I’ll definitely be telling you about it. So you cater? I do it every so often. Very hard work, but rewarding when you see people’s faces smiling after eating your food. Cheers. I do love individual cheesecake servings the the chocolate note is a nice touch…Karaoke anyone? Ooo I’m going to have to try this. Condensed milk in cheesecake sounds so good! Wow, those do sound super easy. When you say one package biscuits do you mean like the type you buy in the tube that you just need to bake? peter g – you will never make another one, I promise. I used to do huge functions, but now that my children are small, I am more selective of which functions I want to take on..
peter m – The people that I am serving this to, loves music, so I thought it would be a nice touch. eatme_delicious – although condensed milk is so sweet, the cheesecake is not at all. kat – no, not at all. I mean a packet of cookies. About 200gr. I was wondering about the biscuit question too. So just some sort of wafer cookies of any flavor? i’m loving this – i need to try it right away. looks so easy and wondefullu delidh. that note! how cool! I’ve never used condensed milk in a cheesecake, but yours looks fabulous, I’ll have to give it a try! Oh biscuits as in the english sense & not the american…that makes much more sense to me now! Tell me did you make the musical note? It’s adorable- I love it! I love the look of that cheesecake! Very colourful and by the sound of it very easy to make too!! recipegirl – I mean a biscuit that you would have for teatime. aria – it is dead easy and you should really try it. kat – you’ve got it..
pixie – yes, I did, thank you…. daziano – Yes, you can, but try it with the cream cheese first. I think you will agree that you do not need the expensive mascarpone. Im liking the use on condensed milk in this one. You know I have to bookmark this. hey did you do that chocolate musical thingy too? Nice presentation. I bet it’s really good!! Those mini cheesecakes look great! I like the individual serving sizes. 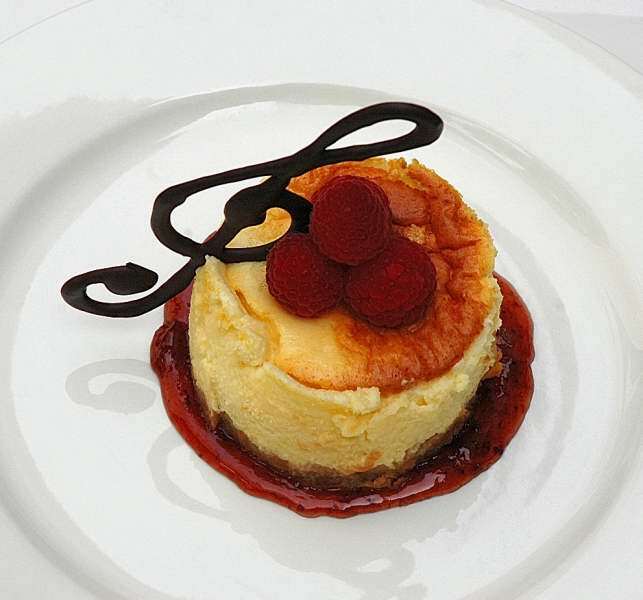 the music note deco looks gorgeous , lovely plated dessert. I really like the idea (as stated before) of the individual dish. Nice touch! what I noticed was the use of creamed cottage cheese… interesting. I wonder if this gives it a sort of consistency that using ricotta would. i’ve made ricotta cheesecake and cream cheese cheese cake – both very different tastes. great pictures! 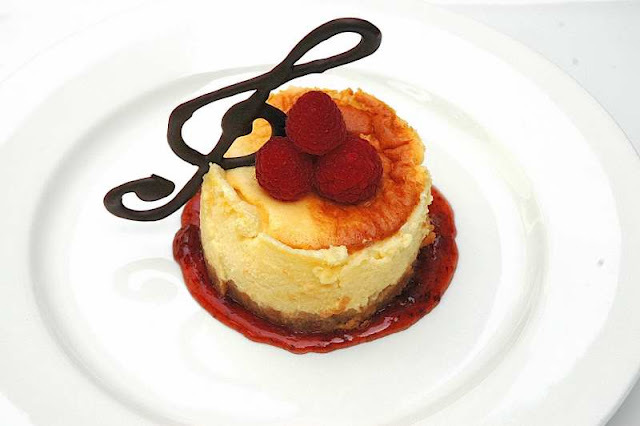 Lovely cheesecake – and the musical note! I think this may be the first cheesecake recipe I’ve seen that uses condensed milk — which I happen to love. I think I’ll have to try this version next time I make cheesecake. glamah – I promise, this one is the best. zen chef – I made everything myself. It really is very easy. kevin – you’re right, then no one has to fight for the last piece. breadpitt – thanks, I appreciate your visits. we are never full – I have never tried it with ricotta, but the creamed cottage cheese gives it a light and crumbly flavor. christine – please do yourself a favor and try this recipe, you will be the star of the occasion. This looks so pretty! Cheesecake is on my list of things to get to but it’s on hold until I get a springform pan. Nina, the cheesecakes look beautiful. I love the G-clef! Did you make it freehand or with a mold? vicarious foodie – hurry and get one, it is so worth your while..
stickygooeycreamychewy – I made the G-clef by hand, I did not know you can get a mould…silly me. clueless- you do not have to bake the biscuits first and the cheesecake is baked at 180C for 25 min, switch the oven off and leave the cheesecake in the oven(with open door) to cool down completely. I would only use cream cheese, but try your way and let me know. Ps. After 25 minutes, the cake is still very wobbly. Do NOT bake longer, the cake sets in the oven as it cools down! Nina thanks so much will try it out for brunch next week..is it better to make the cake on the day or is it okay to make it the day before and refrigerate? PS how do u make the red sauce u had under the cake itlooked incredible! hello Nina, the cheese cake looks delicious, I am going to trait it, I have a question about the sauce .hOw do you make the sauce it had under the cake? it looked delicious. it is rasperry sauce? Hi Nina. Finally worked up the courage to make this divine dessert, but it cracked in the middle. What did I do wrong? I made this cheesecake and it was delicious! Egg yolks in with the mix, then whip the egg whites for a lighter cheese cake. Otherwise just whip it all together! You say a packet of biscuits for the Base. What is the size of the packet of biscuits. Sorry to have trouble you. Can’t wait to make it for my husband as he loves cheesecake and I have never made one before. Ooops, my bad. You need about 200 g biscuits! Hope your hubby loves it! How long should the cheesecake be baked if doing one large cheesecake and not little ones? Thank you for your inquiry. I bake for 25 minutes and then switch oven off, open the oven door and allow cheesecake to cool in the oven. Best cheese cake ever!! This is the first cheesecake I have ever made and it was yummy!! It didn’t last long!! I am so glad – yeah for baked cheesecake! Hi there. Are you still answering questions in 2018?! I’m just wondering if it’s a full or half size tin of condensed milk you use?